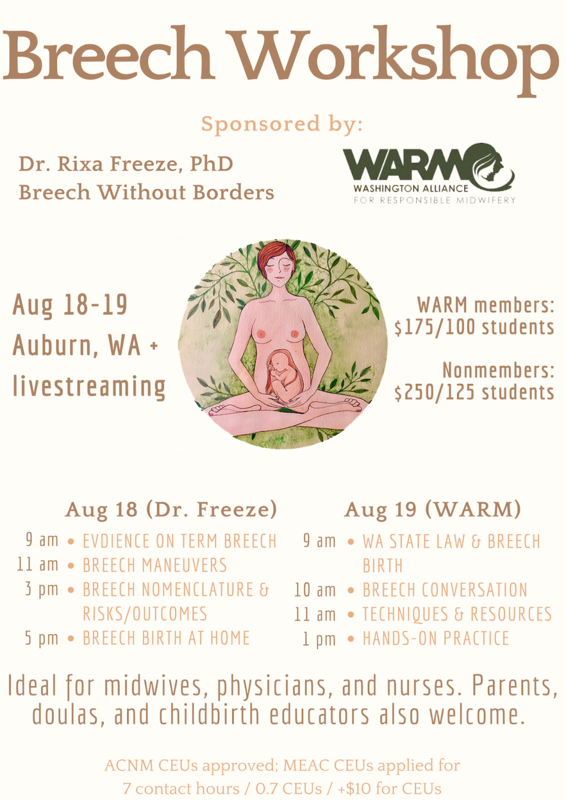 Come to the Aug 18-19 Breech Workshop in Auburn, WA sponsored by Dr. Rixa Freeze, Breech Without Borders, and the Washington Alliance for Responsible Midwifery (WARM). CEUs will be available (ACNM approved; MEAC applied for). If you can't come in person, you can livestream the conference. We will also be recording and offering the workshops online. I am presenting four lectures on Aug 18th, mostly theoretical/informational. Aug 19th will be taught by WARM and will focus on hands-on skills and applied practice.